A native of Philadelphia, Ben Paterson spent his younger years studying both classical and jazz music before moving to the great city of Chicago. There he spent years performing and working with the best musicians in town, absorbing the unique blend of Jazz and Blues that can only be found in the Windy City. Now, recently relocated to New York, Ben is poised to bring his unique talents and style to a wider audience, combining hard-swinging grooves, melodic improvisation, and a healthy dose of blues. A highly sought after Hammond B3 player, Ben Paterson has performed with the likes of Red Holloway, Guy King, Henry Johnson, Joel Paterson, Jimmy Johnson, Dave Specter, Myron Walden, Milton Suggs, Kimberly Gordon, George Freeman, Sabertooth, Ernest Dawkins, and many more. 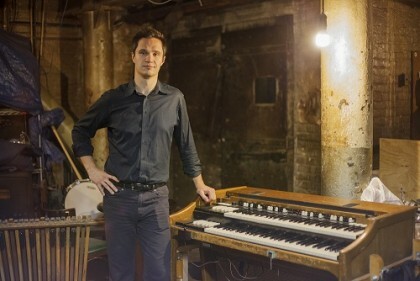 His own organ group, the Ben Paterson Organ Quartet (BPOQ) includes some seriously high powered Chicago jazz talent, featuring George Fludas on drums, Kyle Asche on guitar, and Victor Garcia on trumpet. The group blends hard swinging jazz chops with blues and funk influences, creating a sound that is hard not to like, and impossible to ignore.